Summer is in full swing in Florida and I have been on a strawberry kick since the beginning of May. Luckily, organic strawberries have been on sale this past month so I have been stocking up on my favorite berry. I found myself with a few too many cartons so I decided to whip up this amazing dessert for my husband and I. I posted about in on my Instagram Stories and received so many DMs saying you wanted the full recipe. So, without any further delay, enjoy this quick and easy dessert that you can make with simple pantry items. Side note: This is a great recipe to make with kids since it’s very straightforward. You can also swap out the fruit for any kind you like or use frozen. Gluten free, vegan, and refined sugar free! 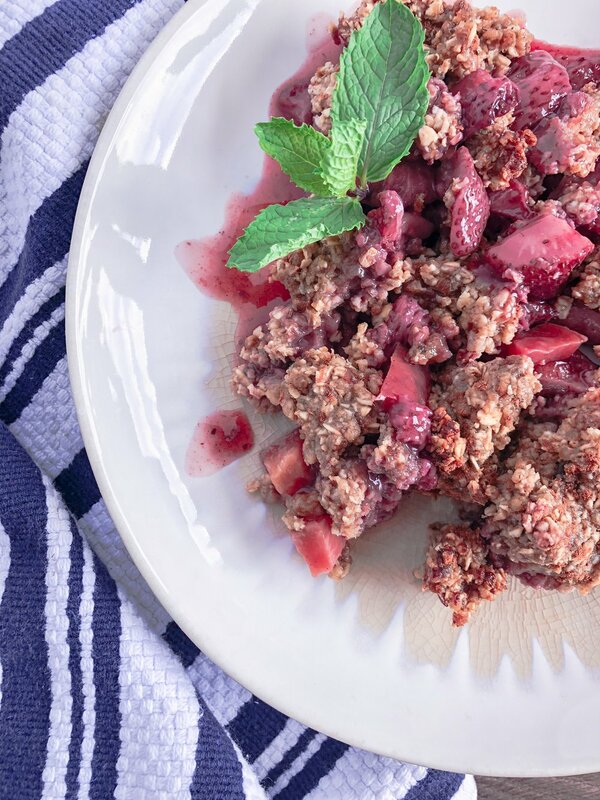 The sweetness from the fruit and the dates in the crumble make this dessert taste like a decadent treat without any nasty artificial sugars. The arrowroot powder helps create a gorgeous and divine syrup that will have you licking your plate clean. Remember to grab a carton of your favorite dairy-free vanilla ice cream and you will be a dessert hero! 2. Wash, cut the stems off, and cut the strawberries into chunks. Wash and cut the peaches as well. 3. Layer the bottom of your dish with the fruit. Sprinkle them with the arrowroot powder, coconut sugar, and vanilla. Mix with a spoon until well combined. 4. In a food processor, pulse the oats, pitted dates, mulberries, lemon juice, cinnamon, and vanilla until the crumble is sticky. 5. Layer the crumble over the fruit in large chunks until the surface is covered. Dust with cinnamon and cover with foil. 6. Bake for 30 minutes, then remove the foil and bake for an addition 10 minutes (it’s ready when you can see the fruit bubbling). I really enjoy connecting with you all so please come hang out! If you have a favorite recipe that you want "healthified," send me an email (christina@thegreenspatula.com) or a DM on Instagram and I will try to make it into a blog post for you. Life is too short not to enjoy our favorite desserts every once in a while.